A new hero is needed for an uncertain time. Weapons of mass destruction, while outlawed by the nations of the world, have fallen into the hands of criminals. The threat posed by these weapons makes citizens fearful. Just as it seems the criminal element is going to be successful, Michael Miller comes of age. Michael is a young man with unusual abilities due to the fact he is the child of a human father and alien mother. Bipedal aliens visited the world in 2047 and Michael's mother reamained. Will Michael, aka Tiger-Man, be able to meeet this challenge and will his abilites be enough to offset the evil genius of a mad scientist and his devilsh henchman? Only time can truly tell, however uncertain. What would have made Tiger-Man better? It is too poorly written that I can't begin to advise how to make it better... unrealistic human interaction and conversations. 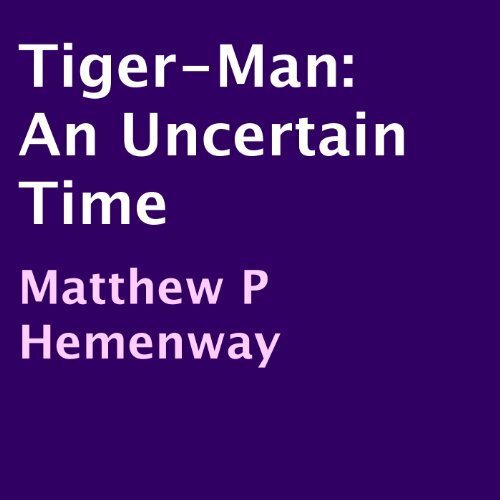 Has Tiger-Man turned you off from other books in this genre? She doesn't even annotate properly. I wouldn't waste your credit with this. Perhaps written for a young audience? I listened twice, adding up to the first 45 minutes of Tiger-man. I gave up! What made me think that this piece of literature was meant for children is the repetitiousness in every scene. The who, what where and the who, what, where and the who, what, where...as if the reader (or author) has severe, short-term memory loss. I think the book might be enjoyed by 10 year-olds or younger. 10 year-olds or younger. 10 year...well, you get it. Also, the narrator's audio is muffly sounding.